These things are bound to happen. I was just getting ready to cut some blocks for “Bed of Roses” to ship out. While I was getting ready to cut the white backgrounds for the blocks, I happened to notice it looked a little whiter than I remembered. You guessed it, the bolt I have been cutting from for the last 2 months worth of blocks is the wrong white. My sincerest apologies. Please, please check through any blocks you received in the last 2 months (check both blocks and borders) and take out the white background. Compare it to the previous blocks and you will be able to see the difference. Very close, but very different. I will replace all of the “wrong” background and replace it with the “right” background. Free of charge (of course) and free shipping. Please email me and let me know what you need. Last post I showed the step-by-step photos of The Glorious Eagle Block I taught at the Wiltwyck Quilt Guild in Kingston, NY. This post I would like to show The Braided Basket block. It is a little more challenging, only because there are a few more pieces and it has a fair bit of layering. If you are planning on making this block, the first question you will probably ask is “Where do I start?” Well, you can start with the basket. I made all of the bias strips for this basket with my 1/4″ bias maker. I used three bias pieces to make the braid for the edge of the basket. Once you have built this much of the basket, you can start to fill it with flowers and leaves. To make life easier, I store all the prepped flowers and leaves in zip lock bags. So I started with some leaves. Next I added the flowers. I added more flowers and a small part of the braided section. This block is put together much like a jig-saw puzzle. Every piece has to fit in it’s own spot! Once all of the flowers and leaves were glued in place, that left room for the bird, which is glued in place on a piece of freezer paper (shiny side up). The bird is then lifted off the freezer paper and glued onto the background. This block is not finished yet. I still need to stitch the blue bow on the handle and trim the long piece of braid. Lovely! 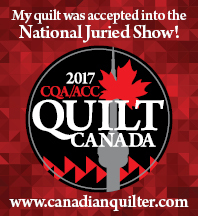 « Thank You, Wiltwyck Quilters! Stunning! Wonderful job! You make it look so simple, ha, no pun intended. I loved taking the class you taught at the guild the day earlier. I look forward to finishing my Eagle and I plan on trying the free project you have. I may be addicted. That is so good to hear! You are an excellent student!! What an amazingly complex block! When you put a block like this together and then go to stitch all the pieces down, do you ever find that you accidentally missed stitching any of the pieces? Oh yes!! That is the fun part especially when I wash the block and some tiny unstitched pieces just fall off!